Do you have trouble with lead generation, building your sales pipeline, and want to learn key lead generation strategies to grow your startup’s email list and customer base? That’s why I wrote this post, so you’ll find 10 great lead generation strategies which will help you grow your email list of people interested in your product or service, build your sales pipeline, and bring your leads deeper into your sales funnel. In the beginning, it’s not entirely easy because you’re just figuring things out, but with practice, all of these lead generation strategies get so much easier. 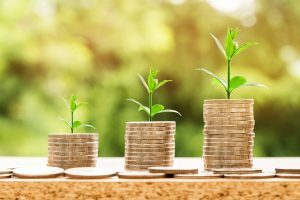 As long as you have built customer profiles and buyer personas and validated your startup idea, then you should be able to use these lead generation strategies effectively for your startup. Hosting free webinars are a great way to demonstrate your authority on a subject, give your target market valuable information, learn what your participants want to see, and generate interest in your business. Industry professionals run webinars all the time to get qualified leads. They market the webinars on social media organically, through paid marketing on social media, and their email lists. And it’s because of the revenue potential they have for your business. If you want to go the free route, you should try FreeConferenceCall.com/free-webinar. It’s highly capable and free for up to 1000 participants. This free webinar service has the same features that almost every other large webinar service offers. Just about every single other service costs money, and they’re not cheap, but webinars remain to be a very useful tool for lead generation. So even if you are paying for a webinar service, you’ll get great value in return when using webinars, assuming you’re presenting on a topic your target audience cares about. Other popular webinars are: WebinarJam, WebEx, Zoom, GoToWebinar, WebinarsOnAir, StealSeminar, AnyMeeting, and Adobe Connect. Webinars are an incredibly powerful lead generation tool for your startup, but you have to do it right if you want those leads to convert. Put time into your presentation and your preparation for it, because it represents your business and brand as a whole and it can leave a lasting impression on people, whether good or bad. You may even want to have the webinar recorded so you can run it at a later time and not have to do a ton of work every time you want to do the webinar on the same subject. If you can record it with the webinar service you use, then you should. Imagine re-using that webinar, marketing it on different channels each time, and then recycling it every 6 to 8 weeks. WordStream produced an awesome article on webinar best practices and you should most definitely check it out. A lead magnet is a promotional piece of content used to get someone to sign up to your email list via your website in exchange for a free PDF, ZIP file of goodies, swipe file, or something similar in nature. Every startup should have a lead magnet because it’s a powerful form of lead generation. In addition, just about every site that cares about lead generation has its own main lead magnet. It’s usually the first one every new visitor sees. 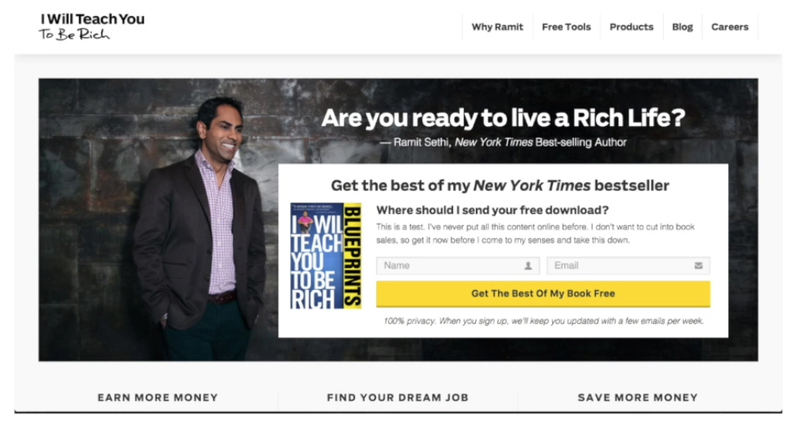 Take this example below of Ramit Sethi’s popup when going to his site. Four excellent services which you can use are Poptin, OptinMonster, Sumo, and Lead Pages. According to Search Engine Land, the average landing page conversion rate for lead magnets is 2.35% across industries. Now honestly, that’s a low conversion rate that you should not aspire to achieve. The top 25% of businesses are converting at 5.31% or higher and the top 10% of businesses are converting at 11.45% or higher. So ideally, you should be shooting for a minimum of 5.31% and do every A/B test possible to find what version of your lead magnet converts visitors into subscribers the best. However, most startups have more than one lead magnet with different value propositions so they can maximize their lead generation. 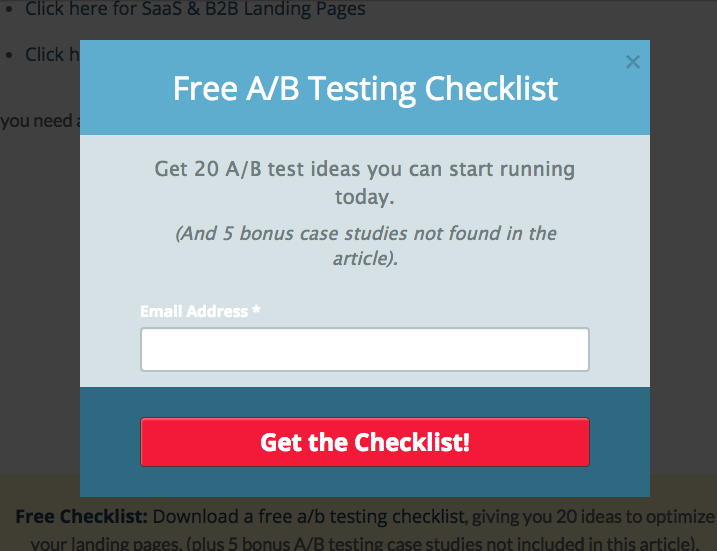 Neil Patel wrote a great article for QuickSprout on conversion rate optimization strategies for lead magnets. I believe you would find it highly useful and you can find it here. While this is the slowest way to get leads, it’s one of the best ways to get brand evangelists and your earliest customers, especially for a startup. There are a lot of places you can go to find your target users such as LinkedIn groups, Facebook groups, Google+ communities, niche-specific forums, or wherever your target customers gather. You can go to LinkedIn groups, Facebook groups, Google+ communities, niche-specific forums, Twitter, or wherever else you can find your target customers. For instance, you can look at posts of yours that your target customers liked or look at of competitors’ posts on Facebook or Twitter, then see who liked them and contact those people. 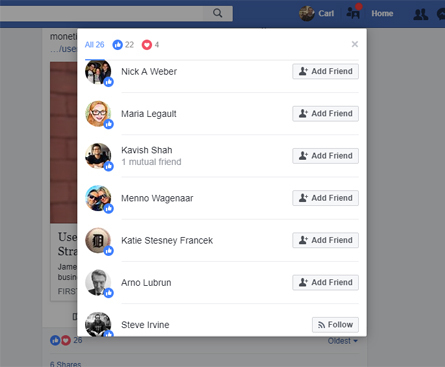 This example below shows all of the people who reacted to a specific post on Facebook. While this effort doesn’t scale, it’s a great way to start an online customer base from scratch or to continue expanding your existing email list. 1) Engage with them as human beings, not like sales prospects. 2) Learn about them including their strengths and struggles. 3) Tell them about what you’re doing and ask if they’re interested in what you’re doing. 4) They’re looking for solutions to their problems, so if you have a solution to one of their struggles, then talk to them about it! 5) Ask them if they’d sign up for your waitlist or for your email list. 6) If you have an existing solution to their problem, ask them if they’re interested in buying it. You can give them a special discount with a time limitation so they’re more likely to buy from you. Remember – you miss 100% of the shots you don’t take, so start contacting your target customers and building relationships with them! 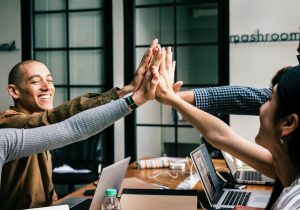 Viral referral rewards campaigns, viral contests, viral milestone campaigns, and viral marketing giveaways are amazing tools for lead generation and publicity. Because each person that refers more people and performs more social and sharing actions can get more entries to win and/or unlock special perks. However, it has to be relevant to your target audience. You have to offer something to them that they would want and want to share to receive. Dropbox was the first company to really start this kind of trend and it worked tremendously. I can vouch for that statement personally as I’ve received tons of free cloud storage via the referrals I sent out to my contacts. Ten years later I’m still receiving benefits from referrals I first sent out. 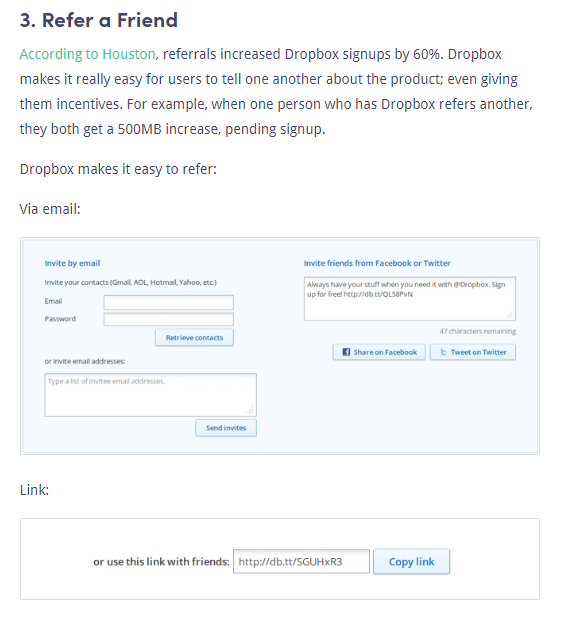 Below is an example showing Dropbox’s referral setup and opt-in. When your contest or referrals spread, you can then get your startup or brand in front of thousands and thousands of people. Every person that enters provides their email address. So those are instant leads right there. In many of these contest platforms, you can also force people to perform a double-opt-in to ensure they’re not giving you a fake email address. You may get fewer entries overall, but at least they’ll be real people. And, in many of them, they have anti-fraud filters. There are well over 25 viral marketing platforms. It’s a pretty crowded market, but almost every one of them has a unique aspect to themselves. 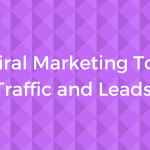 However, I researched, picked, and wrote about the top 15 viral marketing tools to help you get more traffic and leads fast. Check them out and decide which one works best with your vision for your lead generation strategy. Coupons are great ways to promote not only signing up for your email list, but also create urgency to purchase your product/service. There are many different ways to offer your coupons. Most of the time $10 off is more effective than $10% off if the product is worth less than $100. People want to get a significant deal. The most effective way to find out what coupons work best is by doing split tests, or A/B tests to see which type of deal and what copy used gets the most sales conversions. Many e-commerce websites will use a top bar that sticks on the top of your website with an incentive for a coupon that’s received upon subscribing. Other websites have regular popups with coupons (see example below) while others will do one-time coupons with deep discounts for annual subscriptions. A content upgrade is when you post an article or piece of content on your website and then you offer it in PDF version or offer a bonus that’s directly related to that content in exchange for them to opt-in to your email list. Essentially, it’s another form of a lead magnet. 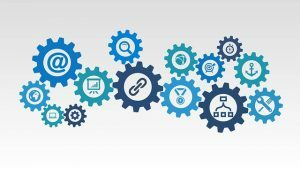 It can be a popup box, a popup welcome mat, a link from within your content, a link in a fancy box from within your content, in a widget from a sidebar, or any combination of these lead generation strategies. 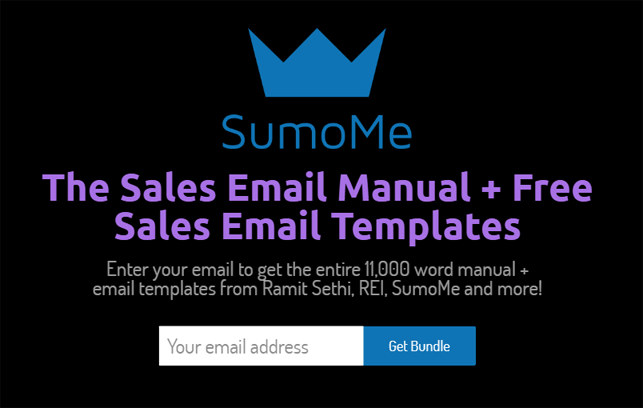 Below is an example of a content upgrade from Sumo’s Sales Email Guide. They have the whole post on their website, but they offer it in PDF and include a bonus with sales templates. What’s more, you can integrate your content upgrade lead magnet with most email hosting providers, as long as you’ve purchased a pro version of the software. No free version, from my research, allows email integrations. You can manually add your subscribers to your email service, but if you’re getting a lot of traffic, it can become quite tedious. To make content upgrades happen, you can use OptinMonster or Sumo. Thanks to Opt-in Monster’s article 30 content upgrade ideas to grow your email list, we have boatloads of examples of lead generation tactics for your startup. 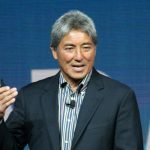 Another great resource for creating content upgrades can be found at backlinko.com. It helps you understand the selling aspect of content upgrades so that they can have the maximum efficacy for the highest conversion rates. When you do content marketing by sharing posts with content upgrades within each of them, your conversion rates will SKYROCKET. Please be aware that this section contains affiliate links to Poptin, OptinMonster, and Content Upgrades. While you cannot directly get leads by doing live streams, you can indirectly get leads from them. One huge advantage of both Facebook and Instagram live streams is that they notify the people following you about it. They rank high on people’s feeds too, so your audience reach is higher than any other type of post. However, you only have about a minute to capture people’s attention before they close the feed, so you ought to make it interesting. On Facebook, probably the best place to do a live stream is in your Facebook group, that way you can generate leads from people who are already warmed up to you. Instagram, however, does not have groups. Instead, you can spread your live stream by posting it with hashtags of the relevant topic and by sharing it on your profile after the video has ended. If you don’t share it afterward, then Instagram users won’t be able to see it. Make sure that when you share it, you also use plenty of relevant hashtags. Once you capture the attention of your audience, you must have a strong call to action to opt-in to your email list for a killer bonus guide or similar incentive that they’ll get. People usually psychologically connect more with video than they do with pictures and words. It’s a real person, a face to the name. And, if you’re authentic and genuine, it will show. Kim Garst wrote a wonderful post on the differences between Facebook Live vs Instagram Live and what the best practices are. You might want to check it out. Free trials are an awesome lead generation tactic which will help you get more than your foot in the door with your target customer. If you can offer your visitors a free trial, then you just reduced their barrier to entry. Meaning, you brought them one step closer to buying your product or service. Not only do you get their email address, but the visitor took a crucial step in terms of behavioral marketing. Behaviorally, for every additional action they take on your site, they’ll become more comfortable with you every time they perform an action. According to Bounce Exchange’s “Blueprint for Behavioral Marketing” guide, 75% of new prospects require more than 1 session to convert. What’s more, it brings them another step closer to buying from you. The fewer barriers to entry, the easier it is to turn them into a lead or customer. If your free trial has no credit card required then the barriers are completely removed. All they need to do is provide their name and email address. 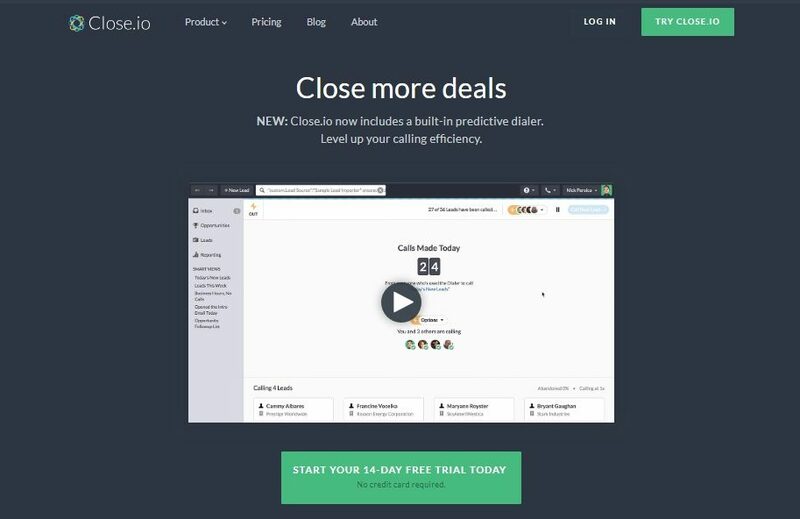 Below is an example of a home page with a free trial with no credit card required as the first thing you see on the Close.io page, Steli Efti’s sales-based CRM. The more barriers to entry, the harder it is to turn a visitor into a lead or customer. However, if they have to use their credit card to opt into your free trial, there will be a larger barrier, but you still get them closer to buying because you already have their credit card information. It makes it easier for them to buy when the free trial is over. So there are pros and cons to both ways. Gated content is effectively a lead magnet. They aren’t always your main lead magnet, however. For instance, you can use software that gates your content so that if someone wants to see if they have to share it on social media. You can have multiple guides or locked pieces of content, but having too many of them all in one place will often turn visitors away from getting that content. Some people just don’t want to keep entering their email address, especially if they’re already subscribed. Don’t gate small-time content that’s not going to be very valuable. In my opinion, it will just piss people off. Gate a PDF book that you made or a collection of excellent content. Below is an example of a quality piece of gated content. Used in moderation, this tactic still remains to be effective for lead generation. If you have a login portal for users to view the content when they’re signed in, that could reduce the barrier to entry if you want to keep a lot of content gated. Conversely, some people won’t care about providing their email address because they know they’ve already opted in before, and they just use their browser’s autofill to complete the action faster. However, some content is gated where they’ll ask for a lot more than your email address. HubSpot does this frequently. They ask for your company name, phone number, email, name, what type of company you have, and even what your position is. Gated content creates a larger barrier to entry because people are less likely to fill out the lead form. But when they do fill it out, you have a better idea of who it is that’s getting it. 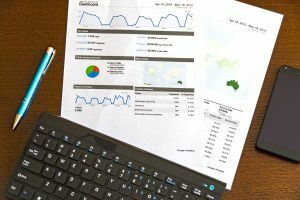 Remarketing campaigns are a great way to generate leads and regenerate interest from old visitors because at some point they had some interest in your startup or business when they visited your website. Both Google and Facebook offer retargeting campaigns using Google Analytics and a pixel tracking code, respectively. Facebook uses a pixel tracking code which you have to install in the header of your website while Google uses Google Analytics (you have to enable the option to track for retargeting in your Admin panel). With remarketing, you have a chance to re-capture these people who visited your website, but you have to give them a really good reason to come back and a really good reason to opt-in to your email list or buy your product. A great reason for them to opt-in is by offering a free e-book or awesome checklist which would interest them via an ad on Google or Facebook. In addition, you’ll want to do this on a specific landing page so there are no distractions from the original CTA you had in your remarketing ad. You can also target people who visited your pricing page or abandoned their cart and never completed their purchase checkout. So in that instance, you’d probably create a great coupon with a time limit on it to get them to purchase ASAP because they’ll have FOMO, or the fear of missing out. When you initiate remarketing campaigns, a crucial aspect of generating higher quality leads is for you to remarket to the individuals that had multiple page views, increased time on page, and micro-conversions such as playing a video or button clicks. When you do this, you will have a much better chance of converting those old visitors into leads. What’s more, people who visited specific pages on your blog or website that may directly relate to your product or service would be a good demographic of people to target your ads to. Do you want to learn more about the psychology of remarketing? Check out the Blueprint for Behavioral Marketing by Bounce Exchange goes deeply into the benefits of remarketing and how to best go about it based on the behavioral tendencies of groups of your visitors. It will be a big help, so check it out. This post outlined ten ways to generate leads and now you have to go out and try doing it for yourself. You may have tried some or several of these lead generation strategies, but the most important thing about lead generation is that they’re qualified leads. Qualified leads are leads that meet the qualifications of your target users. So whatever lead generation strategy you choose, make sure that it’s one piques the interest of people who match your buyer persona, or else your leads will be meaningless. And finally, the last lesson to share with you is that you should A/B test each lead generation strategy as much as possible. The more you do it, then the higher your conversion rate will be for turning visitors into leads. Who doesn’t want high conversion rates? This concludes our post on lead generation strategies. We hope you found it to be helpful for you. If you did, then share it on social media, please. Are there any highly effective lead generation strategies you’ve used that are outside of this list or which one from this list have you found to be the most powerful generator of leads for you? Get more helpful startup and marketing content like this delivered to your inbox. Receive startup development and growth content, special offers, and company updates when you subscribe. Carl is the Founder and CEO of StartupDevKit, an online startup incubator and accelerator with the mission of supporting and empowering early stage startups with education, resources, and mentoring to help founders and their teams not only succeed, but reach their highest potential. Carl has been building and growing startups since 2007 as a founder, consultant, marketer, and recruiter. He's the author of the book Startup Survival Secrets, earned a certification in Inbound Marketing from HubSpot Academy, earned a certification in Google Analytics from Google, earned a Bachelor's Degree from Binghamton University, and achieved Eagle Scout as a young adult. Get help with your startup anywhere from idea validation to launching or growing. Try Our Incubator Program Free for 14 Days. No credit card required. What’s Better? Lean/Business Model Canvas or Executive Summary? © StartupDevKit, Inc. 2019. All rights reserved.